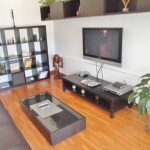 Located in Calle Trafalgar, on the border of El Born and Eixample, close to Plaza Urquinoana. The apartment has two double bedrooms (one large master bedroom with sliding door thst can be converted into two bedrooms when there are guests), small studio perfect for an office, living-dining room measuring 25m2 with fully equipped American kitchen, and one complete bathroom and one guest toilet. 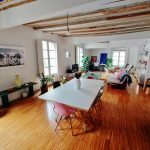 The apartment has modern designer furniture with lots of attention to detail while still mantaining lots of character, with natural wood floors and beams. The apartment comes fully furnished and ready to enter. This is a top quality option for anyone looking for that something a bit special.